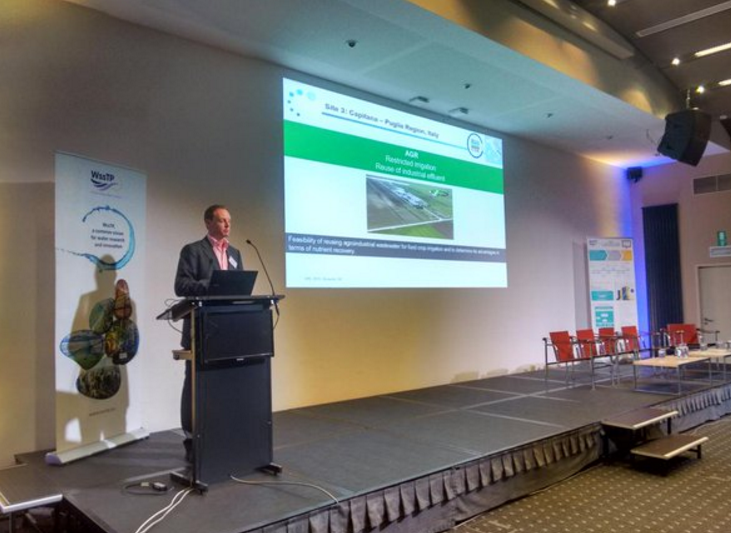 DEMOWARE project was presented last Wednesday 24 of June at the WssTP Water Innovation Europe Event (WIE2015) in Brussels. Water Innovation Europe was focused on exploring the challenges and opportunities for water in the circular economy concept. The conference aspires to examine how a circular approach to water can be given shape in an urban, industrial, and agricultural context. What are the barriers and bottlenecks that stand in the way of a circular approach to water and how can RTD and innovation contribute to realise these opportunities. WIE2015 included a special session on market opportunities outside Europe as well as the 2nd edition of the WssTP Water SME awards. Some outstanding FP7 and H2020 projects, including DEMOWARE, were there to demonstrate how their results will offer concrete solutions for societal challenges. WIE2015 provided participants with excellent network opportunities among potential partners from across the whole water value chain. A special speed-dating session also took place for more targetted networking.